AWID’s WHRD Tribute is a photo exhibition featuring feminist, women’s rights and social justice activists from around the world who are no longer with us. The Tribute was first launched in 2012, at AWID’s 12th International Forum, in Turkey. It took shape with a physical exhibit of portraits and biographies of feminists and activists who passed away. The initiative was described by Forum participants as being a unique, moving and energizing way to commemorate our collective history. At the 13th International Forum in Brazil, we honored activists and WHRDs with a mural unveiling ceremony in four languages, a dance performance and a Brazilian ritual. In between the events, the Tribute lives as an online gallery that is updated every year as part of the 16 Days Campaign Against Gender Based Violence (25 November – 10 December). 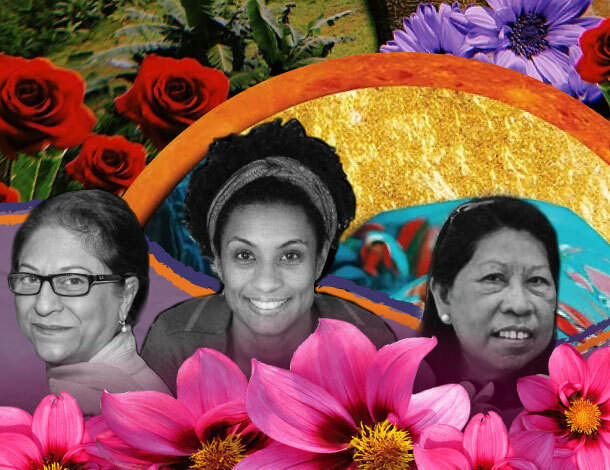 Since 2012, through our annual Tribute to Women Human Rights Defenders (WHRDs) no longer with us, over 400 feminists and WHRDs from 11 regions and 80 countries have been featured. AWID would like to thank the families and organizations who shared their personal stories and contributed to this memorial. We join them in continuing the remarkable work of these women and forging efforts to ensure justice is achieved in cases that remain in impunity. In addition to paying homage to these incredible activists, the Tribute particularly sheds light on the plight of WHRDs who have been assassinated or disappeared. 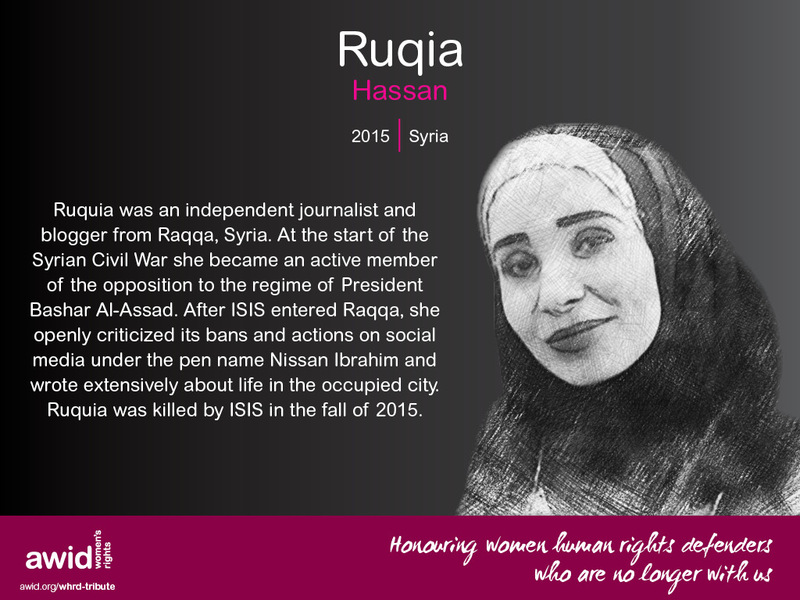 Women like Agnes Torres, from Mexico, was killed because of her gender identity and sexual orientation; or Cheryl Ananayo, an environmental activist from the Philippines was assassinated as she struggled against a mining company; or Ruqia Hassan, a Syrian independent journalist and blogger killed for her criticism of ISIS. And so many others. With the WHRD Tribute, we bring them all into our collective memory and carry their legacy of struggle as our torch in the feminists’ and women’s rights movements. We recognize that security, safety and self-care must be a priority in all our political agendas. And we call on to governments and international bodies to collectively address violence against feminists and WHRDs. We believe this is a critical step to ensure the sustainability of our movements for gender equality, women’s rights, and justice for all.